Photoinhibition was analyzed in O2-evolving and in Tris-treated PS II membrane fragments by measuring flash-induced absorption changes at 830 nm reflecting the transient P680+ formation and oxygen evolution. Irradiation by visible light affects the PS II electron transfer at two different sites: a) photoinhibition of site I eliminates the capability to perform a ‘stable’ charge separation between P680+ and QA- within the reaction center (RC) and b) photoinhibition of site II blocks the electron transfer from YZ to P680+. The quantum yield of site I photoinhibition (2–3×10-7 inhibited RC/quantum) is independent of the functional integrity of the water oxidizing system. 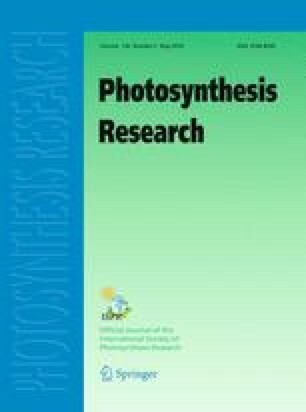 In contrast, the quantum yield of photoinhibition at site II depends strongly on the oxygen evolution capacity. In O2-evolving samples, the quantum yield of site II photoinhibition is about 10-7 inhibited RC/quantum. After selective elimination of the O2-evolving capacity by Tris-treatment, the quantum yield of photoinhibition at site II depends on the light intensity. At low intensity (<3 W/m2), the quantum yield is 10-4 inhibited RC/quantum (about 1000 times higher than in oxygen evolving samples). Based on these results it is inferred that the dominating deleterious effect of photoinhibition cannot be ascribed to an unique target site or a single mechanism because it depends on different experimental conditions (e.g., light intensity) and the functional status of the PS II complex.